I get nostalgic as summer arrives each year; I remember neglecting my homework to go play outside, so excited for the lawn sprinkler. And when school was finally over, well, life just couldn’t get better. In my rose-colored memory, my summers looked a lot like The Sandlot and Troop Beverly Hills (I neither played baseball nor scouted, but I have an active imagination). Even now, I feel a sense of freedom and exultation when I roll down the windows as I drive or play some of my favorite summery music or –gasp!—read a book for fun. Summer can be a sort of academic playground. You can devote your time to concentrated research and writing. You can give that new pedagogical practice a try. You can revise your seminar papers into publishable articles, or prep for exams, or collect data. Without exception, summers have been the most formative and transformative seasons of my academic career. I do my best reading, my best thinking, and my best writing in the summertime. But with summer’s allure—sunshine! beach! unstructured time!—it can be a challenge to stick to a research program or stay disciplined in your writing. Here are five strategies that I recommend from my two years of productive summer research. 1. Write a manifesto. What do you hope to learn through your research? What are your goals, as a scholar and a professional? What do you want this research program to do for you? How does this fit into your big-picture career goals? Manifesto writing can be a powerful process of self-authorship. It will help you to stay focused not only on what you’re doing, but why you’re doing it. And when the beach calls, it’s important to remember what’s driving you. Want an example? Graduate students might appreciate The Expert Enough Manifesto; any of these others provide a useful template. 2. Develop objectives. 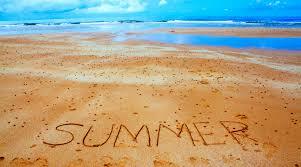 What will you have accomplished by the summer’s end? By the end of August, what will you have completed? Be specific, and be realistic. You may want to complete an annotated bibliography, putting the emphasis on your reading. You may want to complete a draft of a proposal, or a draft of an article. If a manifesto is about what you hope to learn, objectives are about what you hope to do. 3. Make a syllabus. Don’t just make a reading list; make a syllabus. That is, divide your reading the way that you would assign it in a class. Group like texts, pair primary and secondary sources strategically, arrange texts to be in dialog with one another, and consider big themes as they relate to your research objectives. And most importantly: schedule. Plan specific dates, detailing when you’ll read what. This will help you stay on track, and keep you from being overwhelmed by the huge stack of books you’ve just checked out of the library. On this front, I’d also suggest working with your advisor, if you feel comfortable doing so. For each of my summer research plans, I constructed a “wish list” syllabus; my advisor helped me whittle it down and made suggestions. Particularly early on in your graduate career, this can be an exceptionally useful way to read widely in your field. 4. Write daily. This is especially important if you develop a reading-heavy summer plan. My first summer in graduate school, I blogged with a colleague. We took turns writing each week, and commented on each other’s work. It was great to have some accountability, and I look back on those blog posts often to track my intellectual progress and develop those ideas. My second summer, I was on my own, and my regular writing practice fell by the wayside in favor of reading voraciously. While working on comprehensive exams, I realized the error of my ways. Even if you only write a 500-word recap of what you did each day, you need to capture your ideas. Write them down, and set them aside. At the end of the summer, read through your notes. See how your thinking changed and developed. You might discover something new in your old notes, or think about old ideas in new ways. 5. Stay organized. My favorite way to organize the many tasks on my plate is by using a Gantt chart. I like this one from GanttProject. Gantt charts allow you to strategize and prioritize your tasks based on time ranges (“must be completed by…”) and help you to track your progress. I find that prioritizing my work in this manner helps me focus on what needs my attention now and what can wait. And at 5:00, when all I want to do is ride my bike to my favorite bar and drink a summer beer, it’s nice to realize that I can wait to work on those edits. OK, one more: #6: rest. Yes, do research over the summer. Build your summers in to your five-year plan as productive, active times. But make sure that you take the time to recuperate after a stressful semester. Rest up, so that you’ll be ready to face a new academic year clear-eyed. The patterns that we set and develop as young scholars will be patterns that we carry with us throughout our academic careers. Consider your summers training in self-discipline: the discipline to work when it’s time to work, the discipline to play when it’s time to play, and the discipline to know the difference.